Falls and the injuries to which they often lead cause a large share of the burden of disease and disability on older people. The risk of falls increases steeply with age. Injuries from falls (such as femur fracture) usually require hospitalization and costly interventions, including rehabilitation, and cause much of the functional limitations that lead to the need for long-term care, including admissions to nursing homes. Frailty in itself can considerably increase the risk of falls, which can happen in all settings. About 30–50% of people living in long-term care institutions fall each year. Convincing evidence, however, shows that most falls are predictable and preventable. Some injury-prevention measures (such as hip protectors) have been shown to be cost effective or even cost saving, and there are examples of successful implementations of strategies to prevent falls, supported by public policies. Healthy ageing is a lifelong process. Patterns of harmful behaviour, often established early in life, can reduce the quality of life and even result in premature death. Poor nutrition, physical inactivity, tobacco use and harmful use of alcohol contribute to the development of chronic conditions: 5 of these (diabetes, cardiovascular diseases, cancer, chronic respiratory diseases and mental disorders) account for an estimated 77% of the disease burden and 86% of the deaths in the European Region. The most disadvantaged groups carry the greatest part of this burden. In addition, a healthy diet, regular physical activity, maintaining a normal body weight and avoiding tobacco use can delay or prevent the onset of type 2 diabetes. The risk of poverty grows with older age and is much higher among women than men. The prevalence of poverty (defined as having less than 60% of the national median income) among people older than 65 years varies widely across Europe. For European Union countries, for example, the prevalence is 4% in Hungary, 5% in Luxembourg and 7% in the Czech Republic, but 51% in Latvia, 49% in Cyprus and 39% in Estonia. Moreover, many older people cannot afford to pay health costs, including prescription drugs, from their own pockets. WHO/Europe works closely with Member States to support them in developing policies that reduce this financial risk and ensure a more equitable distribution of the burden of health system funding. Loneliness, social isolation and social exclusion are important social determinants and risk factors of ill health among older people. They affect all aspects of health and well-being, including mental health, the risk of maltreatment and the risk of emergency admission to hospital for avoidable conditions, such as severe dehydration or malnutrition. In all countries, older women have a higher risk of social isolation than older men. 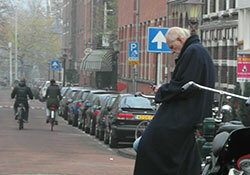 Depression among older people is frequently undiagnosed. Its prevalence in those over 65 in the European Region is estimated at 2–15%. Mental health support, including preventive action, is a vital, often neglected, aspect of medical and social attention to older people. Elder maltreatment is defined as physical, sexual, mental and/or financial abuse and/or neglect of people aged 60 years and older. The scale of the problem has not been fully investigated, but estimates indicate that at least 4 million older people in the WHO European Region experience it in any one year. Maltreatment affects both the mental and physical well-being of older people and, if unchecked, reduces the quality of life and survival. Until recently, elder maltreatment was considered a private matter. Only in the last two decades has the scope of the problem been recognized and systematically studied and addressed in various settings where older people live. WHO/Europe’s “European report on preventing elder maltreatment” reviews the findings of recent surveys and programmes to address the problem in the Region.